Neil Cunningham was the start driver for race one and he had to be up super-early (relatively speaking, these are racing drivers after all) to see the cars in the paddock at ten to nine in the morning. Needless to say the Embassy car was ready and waiting before anyone else, as a result of Jonathan “I get up before I go to bed” France’s preparations. There would be no dramas today, just good planning and some excellent racing. It was a good thing that Neil was in a racy mood too, starting from eleventh on the grid would give him plenty of work, especially as Embassy now had the maximum twenty second penalty to be added to their pitstop time due to the strength of the driving duo. Away from the rolling start and the Jones twins’ Porsche was quickly despatched on lap one with the Tech 9 cup class example also receding in Neil’s mirrors. At the front the unhindered leaders were already stretching away and the pressure on Neil was really on. 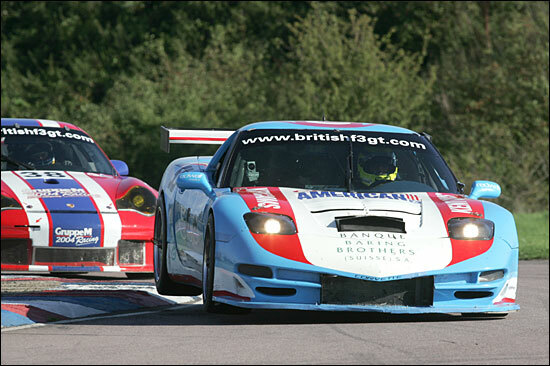 Two laps later and he brought the blue Corvette up behind Dan Eagling, going it alone in the Peninsula TVR. 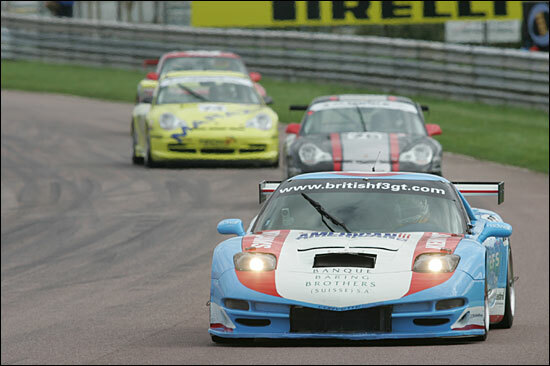 Eagling was balked at the exit of the chicane as Ricky Cole in the Xero Corvette swung back onto line, after having a look at the Scuderia Ecosse Ferrari ahead, Neil pounced, easily outgunning the TVR and having a good look at Ricky Cole, first left then right. Ricky showed Neil what he knows already – the Corvette is a wide car. They fought through the lap and with grim determination to get to the front Neil made his move stick at the chicane next time through for sixth place. Half way to the front in six laps - not bad going. Chris Niarchos was Neil Cunningham’s next target but was some four seconds ahead, not really a problem as Neil was among the fastest cars on the circuit at this time. As it turned out, Niarchos would have to wait as Neil capitalised on Mike Jordan’s problems and Kinch having to stop to get grass removed from the Ferrari’s cooling grilles. 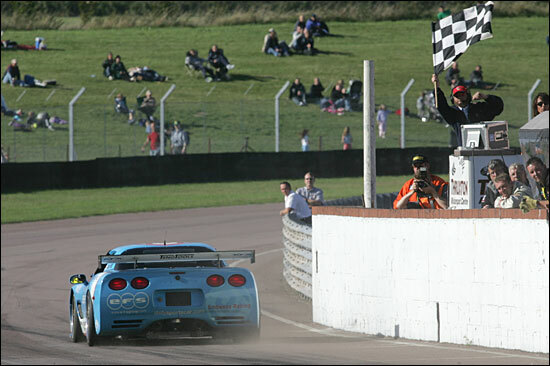 Now Embassy were fourth and looking good for a podium – so again Neil charged on and the Corvette was now the quickest car on the circuit. Just 12 seconds behind the leader on the track translated to 32 seconds once the 20 second penalty was factored in, so he kept up the fight with Niarchos once the two leaders pitted in. Corvette touched Ferrari but Cunningham emerged as the overall leader, giving the new boy a hard act to follow when Neil pitted at the half-way mark. “He drove like Montoya in the Grand Prix, making every move stick,” summed up team boss Jonathan France. 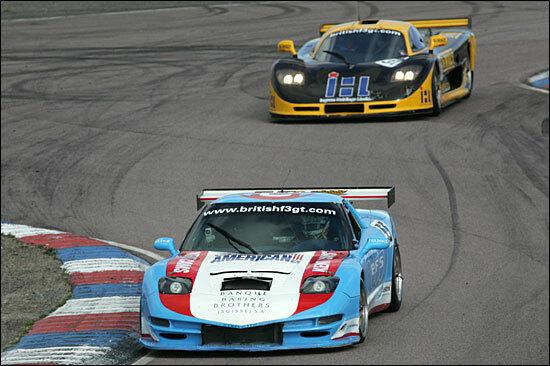 It looked like he might have nicked fourth though after Balfe lost time in the pits having his battered Mosler checked over - and then returning to the track, only to spin out of the chicane whilst sandwiched by the already waving chequered flag and the Embassy Corvette bearing down on him. 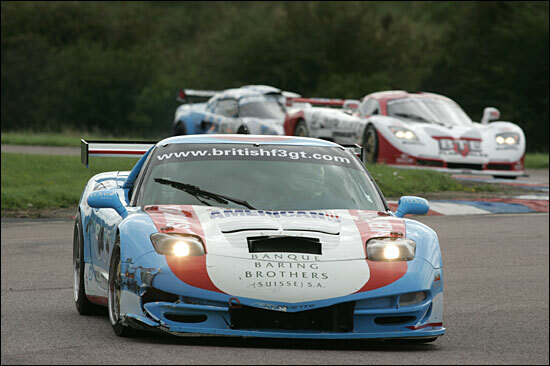 Fortunately for Balfe, the Mosler ended up pointing the right way and he floored it over the line just over two seconds before Ben thundered through. 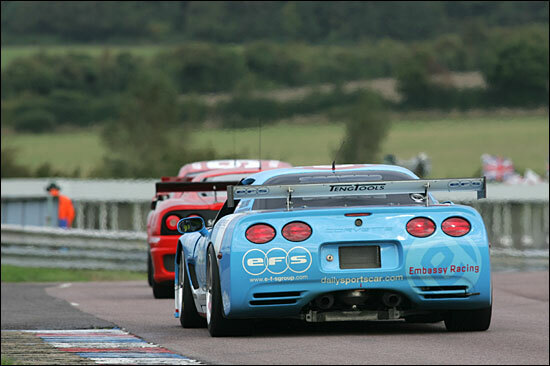 Taking the start for the late afternoon race (right at the back), Ben powered past all but one of the cup class cars in the first lap (“it was a busy lap, but good fun”), no fewer than ten cars relegated to looking at the four round lights on the rump of the Corvette. Not that he was concerned about what was behind him – it didn’t matter. What did matter was the fact that eighth to fifth were presented in front of him perfectly and enticingly. Eagling made a move on Sumpter and Collins followed the TVR through, and with no further regard to Eagling for unsettling Sumpter, he soon passed the TVR as well for good measure. 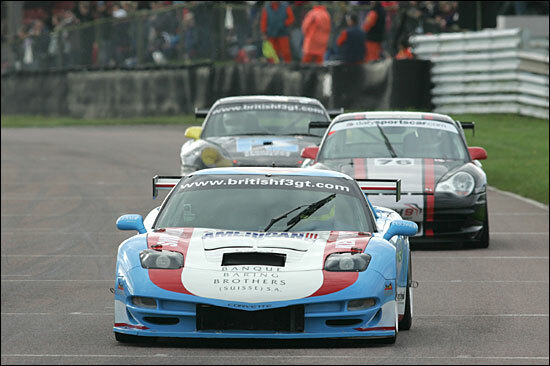 This was exciting stuff, sixth place from 20th on the grid in just six laps. The car and driver were at one. Ben then made good inroads into gap to the Rollcentre Mosler and the Jones Porsche, just before the safety car made its first outing of the day for the GTs. This was not the greatest news for those like Embassy with a twenty second penalty added to their pitstop, because all Ben’s efforts at pulling away from those behind were undone. It is worth noting that only ten minutes or so had passed by this point in the race! For once this worked in Embassy’s favour – with the pack controlled by the safety car, it wasn’t such a disaster to lose the extra twenty seconds in the pits. Everyone else had the same idea of pitting during the safety car, but Jonathan France was still delighted to see Neil sitting behind the safety car, Kinch and Cocker – yes, he was third with just under a twenty minute sprint to the finish once the safety car dived back into the pits. 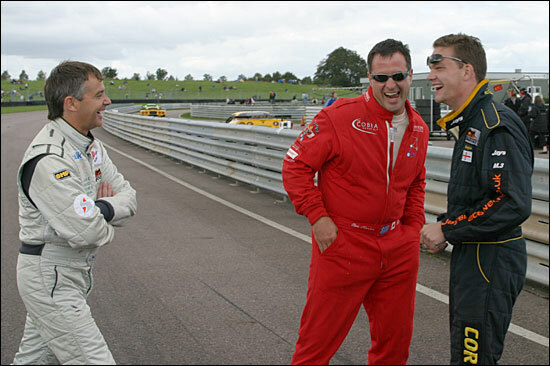 Initially holding back as the two title rivals began to squabble, Neil realised that Jonathan Cocker was unlikely to do anything silly, given that bagging third in this race would give him the 2004 crown. “I still had to push hard though, giving it everything. I found out Church isn’t flat though, I had a go but it changed direction about three times, I think I saw three churches!” Pressuring Cocker, Kinch made a move out of the chicane and Neil hung onto the Ferrari’s wing tails and swept alongside the Porsche over the line, before pulling off one of the proudest overtaking manoeuvres of his career. And so it remained – the cheers from the team proof enough that the elusive podium was an excellent result – especially from 20th on the grid. The cheers and applause from other teams and onlookers were also louder for Embassy than those provided for the winners, and even for Jonathan Cocker’s title-clinching third place. Popular as ever, Jonathan France has never experienced such joy whilst his eyes hurt so much – that was an awful amount of champagne Neil had doused him with. “It’s been a long time coming and we are going to make the most of it,” concluded the team owner. Doubtless this means he will be doing everything he can to keep the feeling flowing all through the Brands Hatch season closer in October.